My friends Mark Spina, Theresa Panny and Kim Nastaszewski and I took a Western Caribbean Cruise from 4/13 thru 4/20/14. Our ports of call were Roatan, Honduras, Belize City, Belize, Costa Maya and Cozumel Mexico. We drove down to Tampa Florida on 4/11. We spent the night of 4/12 with Theresa’s father on Sandy Cay. We can’t thank him enough for his hospitality. * The Piratic Flycatcher story didn’t end there. 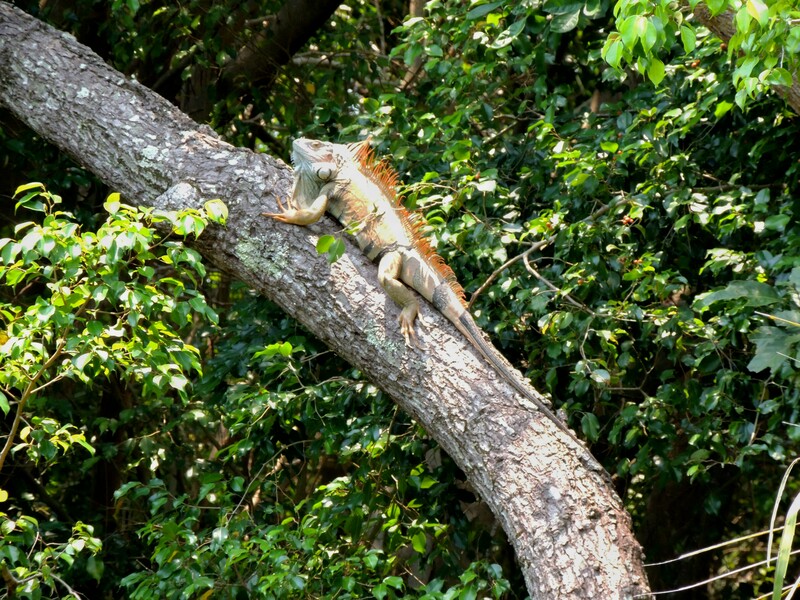 About a month after returning from the cruise, I was contacted by the regional reviewer for Roatan, Honduras. He asked if I was able to verify my sighting of the Piratic Flycatcher and provide further details of the sighting. I sent him a couple of diagnostic photos and explained how I found it and identified it. He contacted me again a few days later. 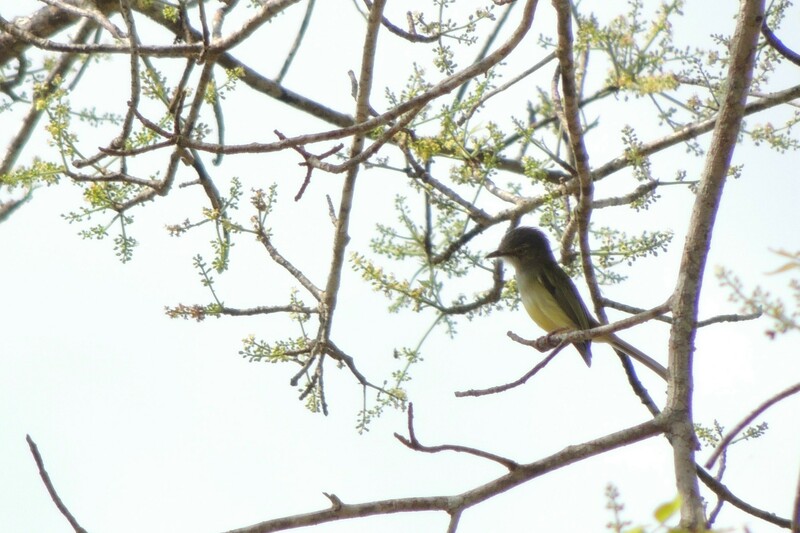 It turns out that my sighting was the first record ever of Piratic Flycatcher for the Islas de la Bahia (Roatan) He was pleased to have a detailed account with excellent photos. You never know when you’re going to find something special. See photo below at end of trip report. This morning we anchored off the coast of Belize. We tendered to shore (small craft into port) and joined our group for the “New River Safari and Lamani Ruins Tour”. Our guides were Gian and Tiffany for the bus ride to the New River Lagoon dock. Once there, we boarded a high speed transport boat for our ride up the New River. The ride was quite eventful as was the bus ride. Of course I’m speaking in terms of how birdy it was. 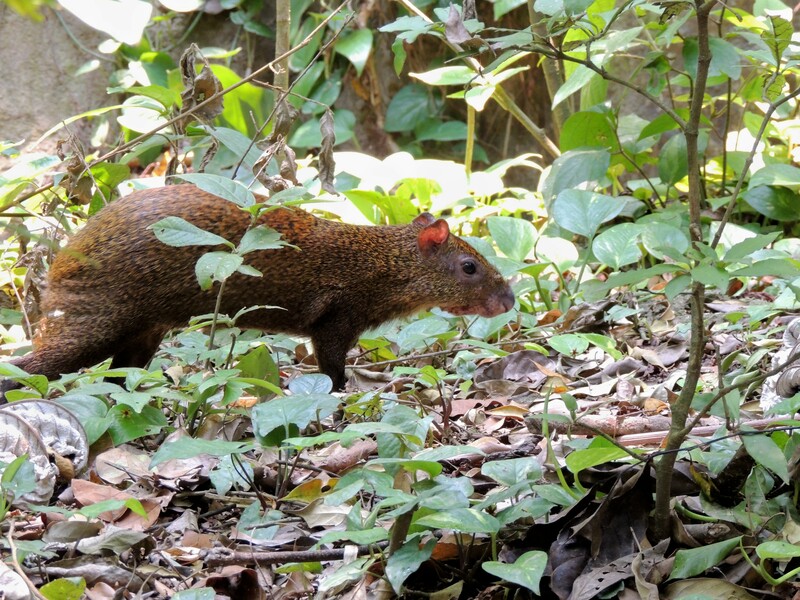 Many new species for the trip were seen and lifers began to trickle in. TROPICAL MOCKINGBIRDS seemed to be everywhere as we pass through Belize City. Magnificent Frigatebirds soared in the sky. A single Caspian Tern flew along the beach. As soon as we got out of the city, Red-billed Pigeons seemed to be everywhere. Black and Turkey Vultures were abundant, but I couldn’t spot a Lesser Yellow-headed Vulture among them. One Plain Chachalaca perched in a tree along the road. Soon, Red-lored Parrots were flying about in small groups. We reached the dock where we had a quick tour and used the rest rooms. I birded, adding several new birds to my list. As we made our way up the New River, Ringed Kingfisher were seen quite often. I just happened to luck out, when looking toward the opposite side of the boat when a tiny Kingfisher flew out of a thicket along the water, flying across a 75 foot opening and disappeared into the next thicket. AMERICAN PYGMY KINGFISHER!!!! While my look was all to brief, the green upper parts and rufous underparts of this tiny bird cinched its identification. Later in the day, a lone Green Kinfisher crossed the river in front of us. 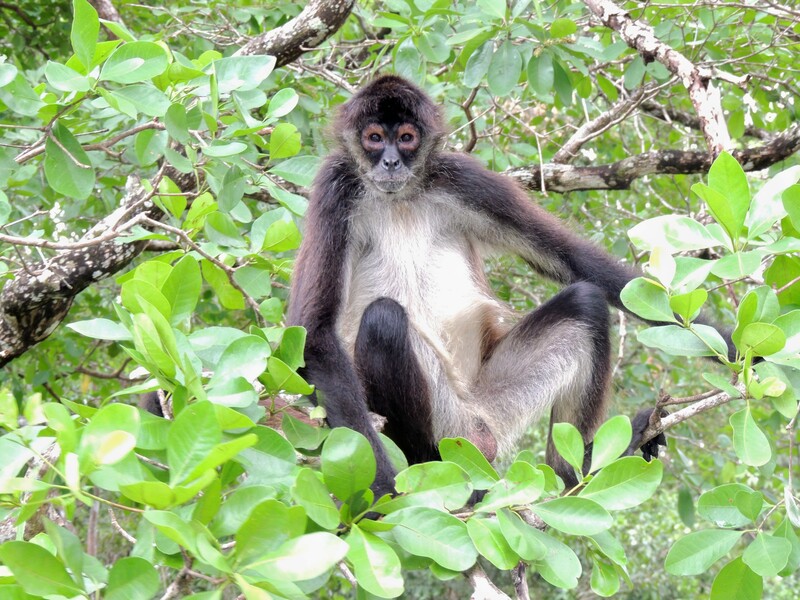 The captain of the boat took us into an area known for monkeys, and a Spider Monkey soon appeared. The captain tossed it a banana and we all enjoyed watching him eat it. MANGROVE SWALLOWS were around every turn. Northern Jacanah were seen in a number of spots. We reached the actual lagoon all to soon. Here we started our tour of these fantastic Mayan Ruins. For me the best part was of course the birds. Red-lored Parrots, Brown Jays, Social Flycatchers and an array of migrating warblers kept me busy. 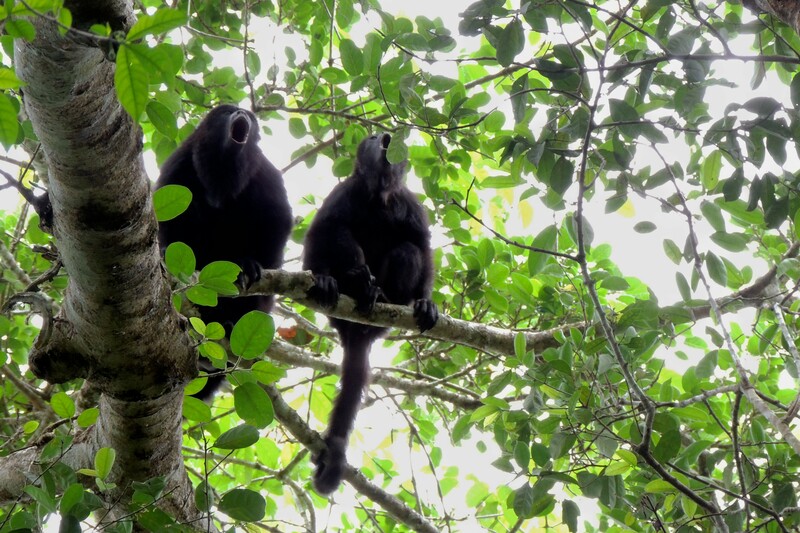 Just as we were leaving the “Jaguar Temple” ruins, a verbal combat broke out between two troops of Howler Monkeys! If they hadn’t met up and challenged each other, we could have missed the show. The troop we could see consisted of at least seven individuals. The second troop was just out of sight in the canopy, but the howling was intense from both groups. A short time later the unseen troop moved on and it became quiet once again. The birds now became the sound of the morning. We could hear all sorts of song and calls throughout the forest. 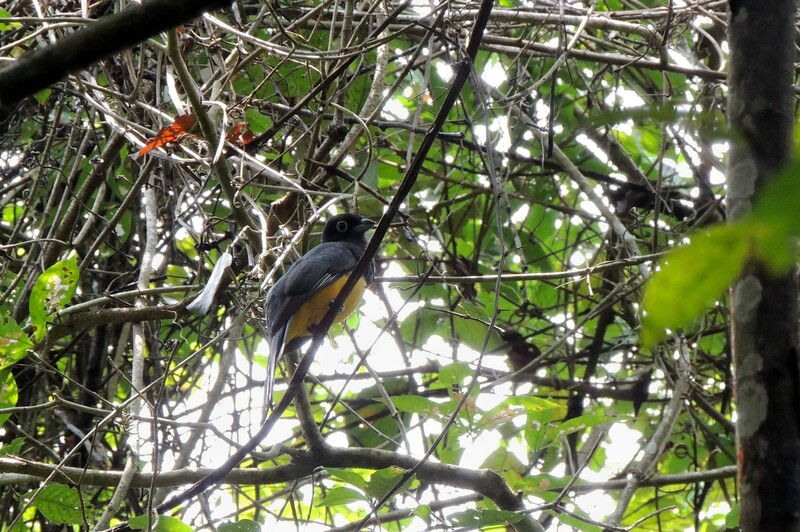 I followed one vocalization and was pleased to find a BLACK-HEADED TROGAN! Now that I knew the call, they could be heard all over the forest. 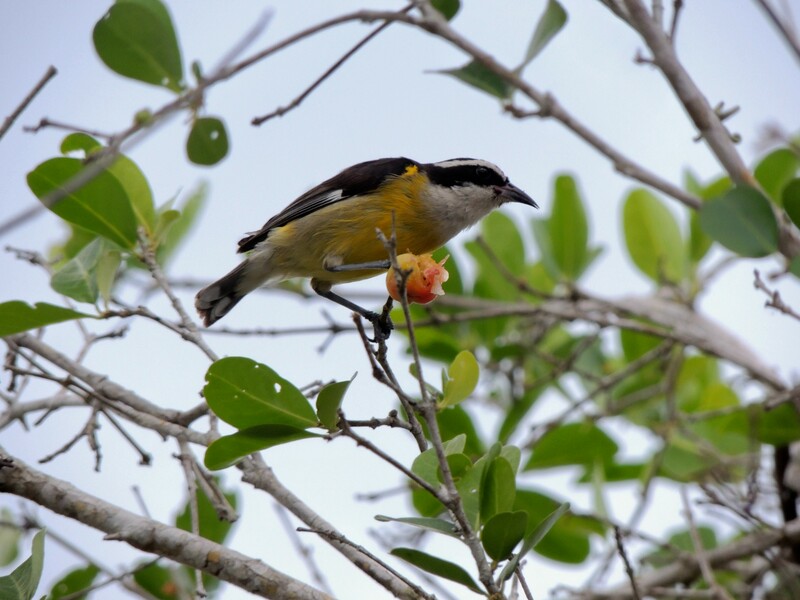 A pair of Yellow-throated Euphonias fed on a fruiting palm of some sort. They posed for pictures and were really pretty cooperative. Neotropical migrants included: Yellow, Tennessee and Magnolia Warblers as well as American Redstart and Common Yellowthroat. 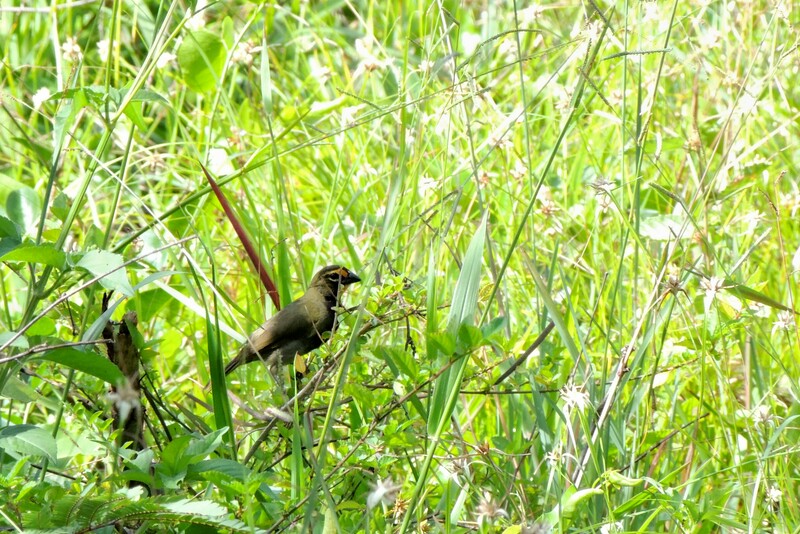 Many birds went unidentified due to the thick foliage of the jungle and the brief glimpses I had of them. A lone hummingbird was feeding on a blooming tree, but gave me only fleeting glimpses as it fed. From what I could see, it was most probably a White-bellied Emerald! I was not able to possitively identify it to species, as at least three possible species are colored white and green with large white spots on the tips of their rectrices (tail feathers). 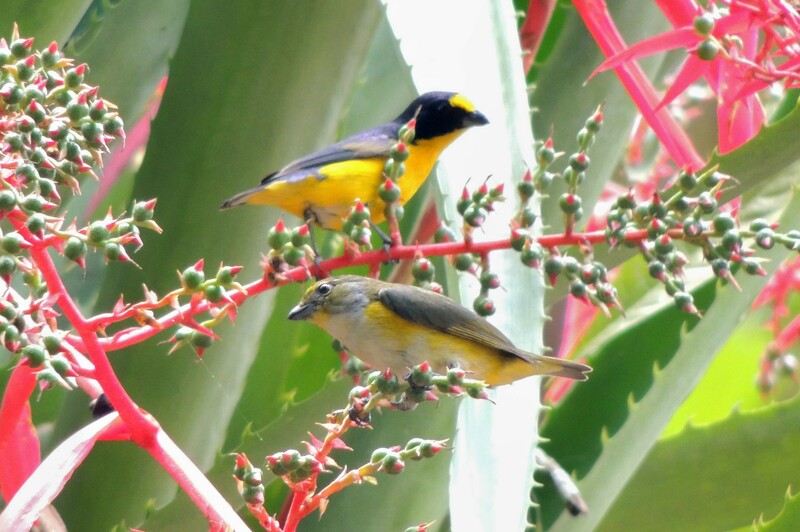 As I passed from ruin to ruin, checking the jungle as I went, I came upon a group of three BLACK-COWLED ORIOLES!! Though they were well up in the canopy, I got some identifiable shots of the birds. As I made my way back to the dock area, now having joined the rest of the group, Brown Jays, Social Flycatchers and a few warblers were seen. Just as I was about to board, I noticed a trogon. I wanted to get a better shot than I previously had, so I moved closer to the bird. I was thrilled to see that this was a new species, GARTERED TROGAN!! We boarded the boat and began our journey back to the main dock. More birds were seen along the way. Upon our return, we had a great lunch of Curried Chicken, Beans and Rice, Salsa and chips and Bread Pudding. When I got done, I began to bird again. Outside the facility I found two Masked Tityra, Vaux’s Swift, a MEALY PARROT, a Clay Colored Thrush and more Red-lored Parrots. On the bus back, I spotted a White-tailed Hawk. One of the highlights of the day was finding another birder on the trip. Tommie Rogers is a woman from Tennessee whom I had originally met over a year ago when she traveled from Tennessee to New York to try to see the Pink Footed Goose. I had met her at the Camel Farm and took her to see the goose. It doesn’t seem possible that we would meet again in Belize, but that’s how small a world it is. It was nice catching up and sharing our birding adventures from the last year. We rode the bus back to Belize City and boarded our Tender to return to the ship. We were quite exhausted from a fabulous day of birding and seeing the Mayan Ruins. I had a total of 58 species for the day including seven lifers. Here is my total list. The letter following the number indicates where they were seen. This morning we docked in Costa Maya Mexico. 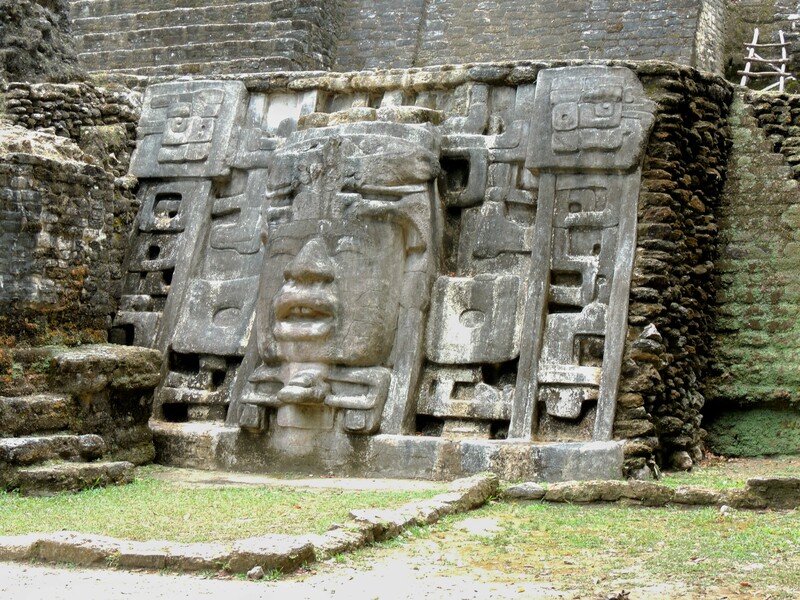 We caught our tour to Chocchoben (chock cho ben) Mayan Ruins, one hour inland. We had a great tour guide, Pablo. We spent the morning touring the ruins. These were well restored, and most complete of the ruins I’ve seen thus far. It was fairly birdy on the grounds of the ruins and quite jungle like as well. Birds seen include many Social Flycatchers and Great Kiskadees, Vaux’s Swift, Melodious Blackbird, Ruddy Ground Dove, Great-tailed Grackle, Northern Cardinal and my first lifer here, GRAY-BREASTED MARTIN! I heard the birds before I saw them and knew I had never heard them before. They flew over repeatedly for several minutes before disappearing over the forest. I also found a flycatcher that I couldn’t identify. It had a large head, long bill, pale eye, slight crest, gray breast with pale yellow belly, no wing bars and a really long tail. I photographed it and it turned out to be a GREENISH ELAENIA! 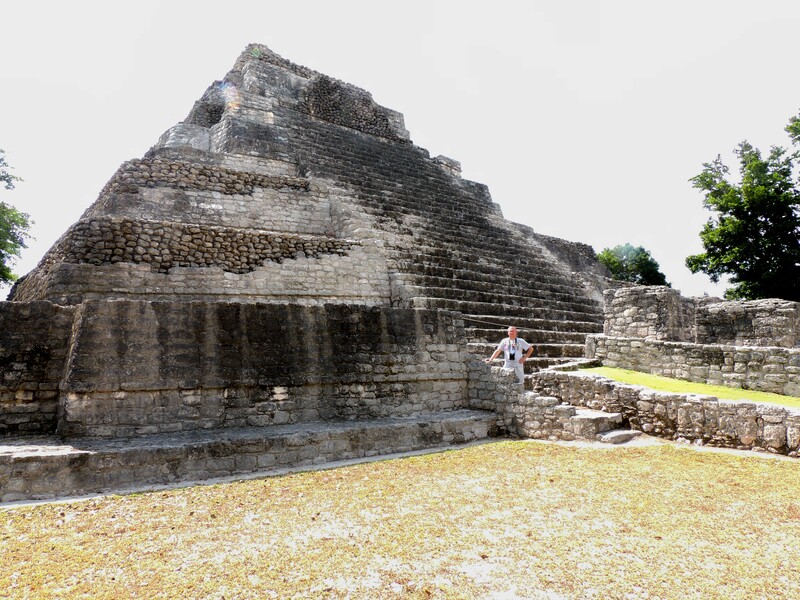 When we finished at the ruins, we headed back to Costa Maya. Birds seen in route to and from the ruins included: Turkey Vulture, Black Vulture, Eurasian Collared Dove, Melodious Blackbird, Roadside Hawk and a Red-billed Pigeon. Back at the port, my friends shopped as I walked around the compound, looking for birds. 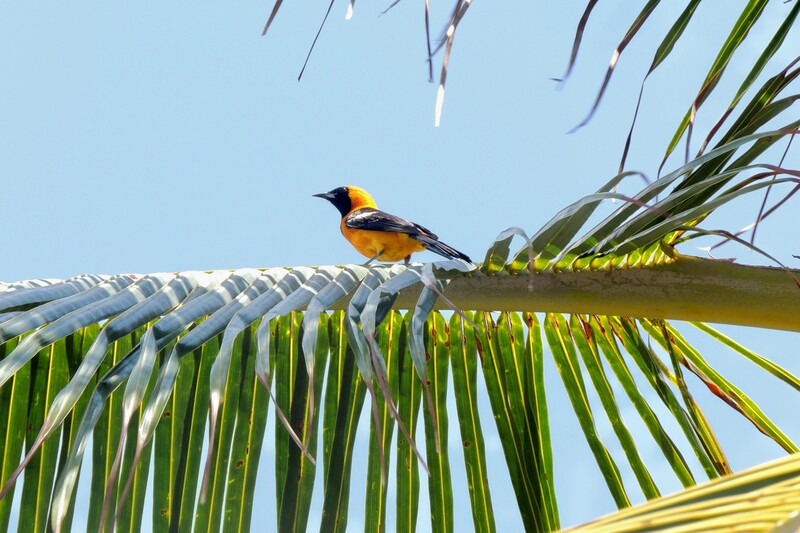 There were several each of Hooded Oriole and Tropical Mockingbird. 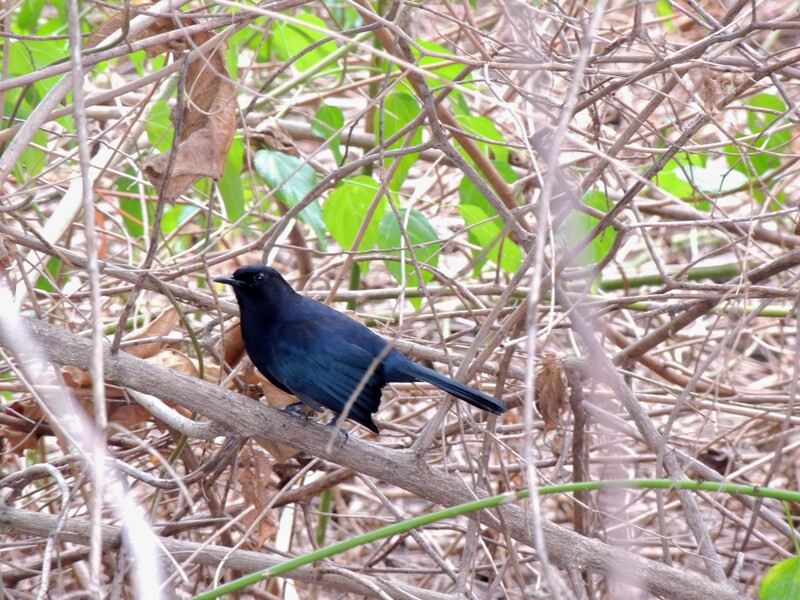 Great-Tailed Grackle were everywhere and I saw a single Magnificent Frigatebird soaring overhead. 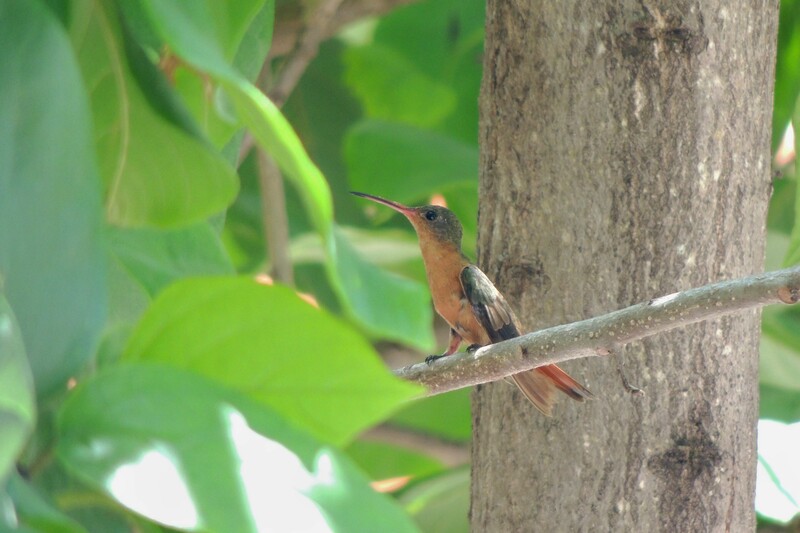 The great birds of the afternoon however were two CINNAMON HUMMINGBIRDS that were feeding and roosting in the Hibiscus Bushes on the parking lot. I was able to get a few good shots of these birds. Back to the ship for lunch and a nap, and it has been another great day. Today, Tommie Rogers and I had arranged to go birding for the day on Cozumel. We met first thing in the morning and rented a car. ( renting a car in Cozumel is so easy. Just enter the common area when you disembark and there are people waiting to rent you a car. It is perfectly safe and easy. We paid $65.00 for the day plus $17.00 liability ) We immediately headed south of town. We had several target destinations for the day, but only made a few of them. Along the highway south, there were a great number of birds to be seen. We made stops at pullouts along the road, and nearly every stop was very productive. We found birds like Melodious Blackbird, Yellow-faced Grassquit, Bananaquit, Tropical Kingbird, Tropical Mockingbird, Summer Tanager and my first lifer of the day, YUCATAN VIREO! 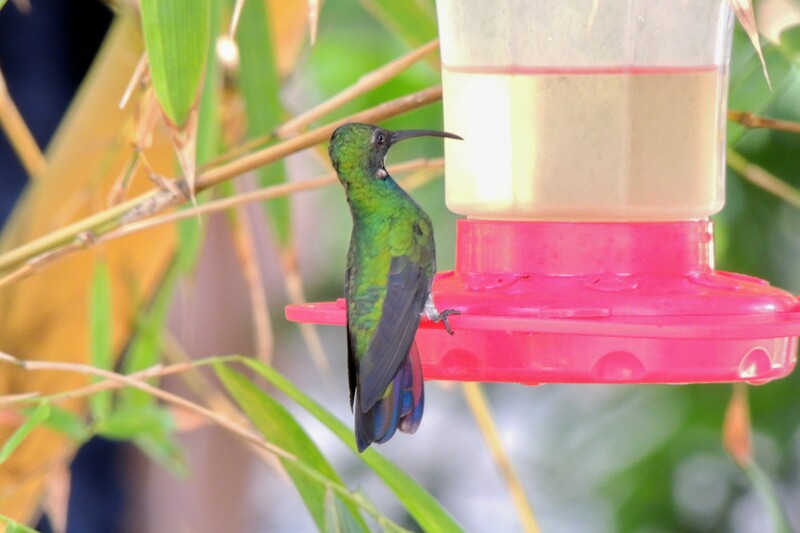 Soon after, the second lifer, COZUMEL EMERALD appeared. 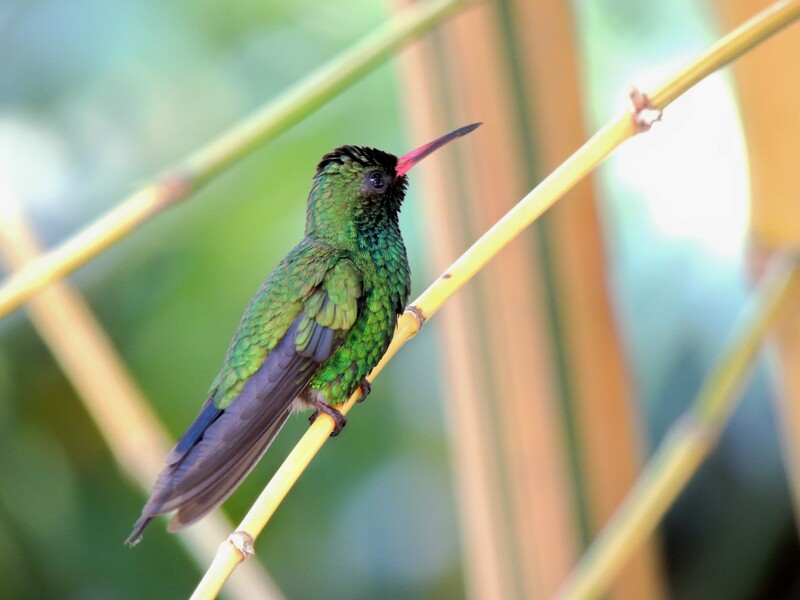 Fortunately, we would see a number of these beautiful hummingbirds throughout the day. 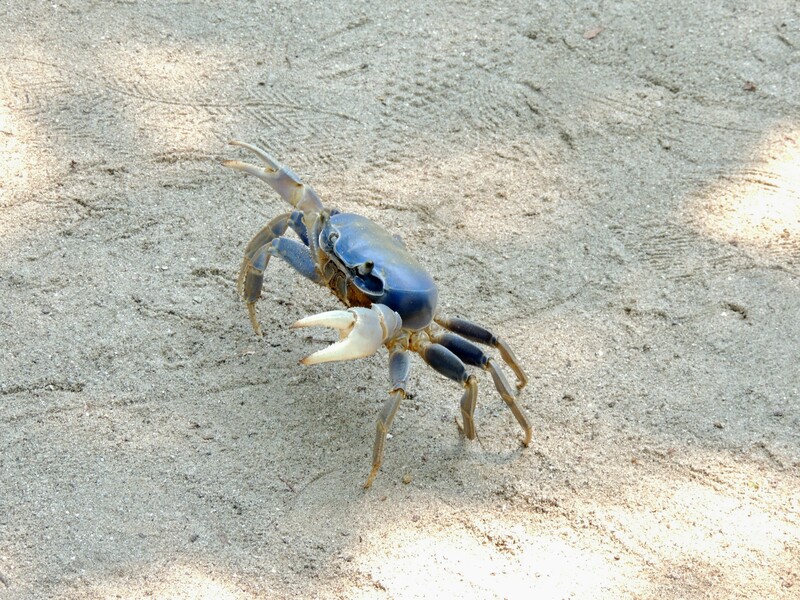 The next big surprise came as we walked a short dirt road to the beach. 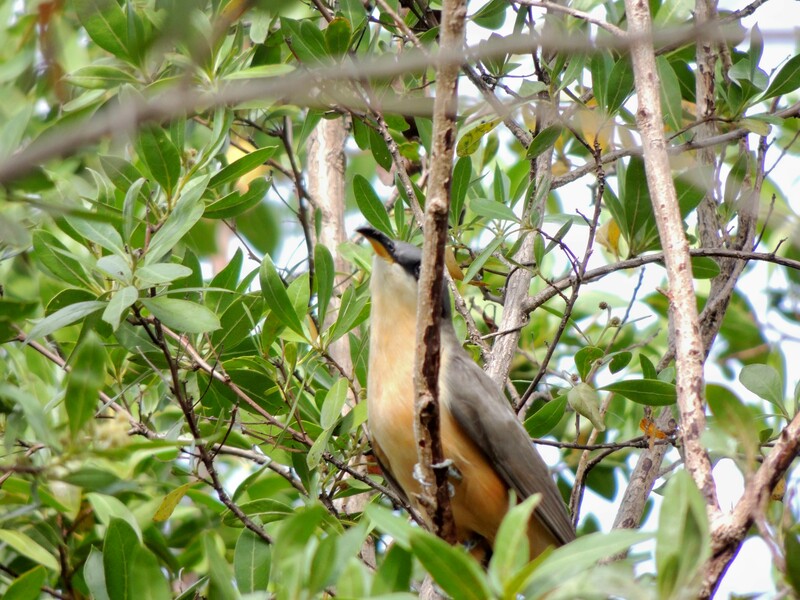 I was watching a Melodious Blackbird, making sure it wasn’t a Black Cat bird when a MANGROVE CUCKOO popped up right in front of me. I fumbled with my camera to get a shot, and was able to get one identifiable shot before the bird took off. Continuing south, we stopped at a small community just outside EL Cid ruins. We spoke with a very friendly woman at her roadside store. We bought a bottle of water (it was Hot!) She let us park across from her store and told us the area was quite birdy. As It turned out, it was. A woodpecker began calling, and it sounded similar to a Red-bellied woodpecker. It flew into view, and it was the much smaller YUCATAN WOODPECKER! 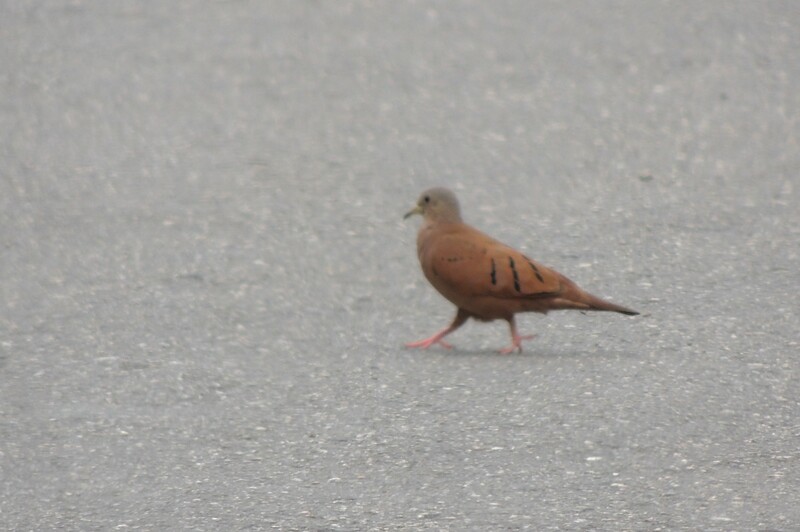 White-crowned Pigeon, Ruddy Ground Dove and the third lifer, CARIBBEAN DOVE were seen. As we headed back north, we found more and more birds. Yellow Warbler, Blue-gray Gnatcatcher, White-eyed Vireo and White-collared Seedeater were all seen. At that point, we decided to head further north and take the “Middle Island Road” across to some ruins that are supposed to be excellent for birds. We got lost in the city and after asking directions several times and ending up lost every time, we decided to head south again. We eventually returned to the area we had birded in the morning, this time choosing different locations to bird. We found a very birdy spot along the highway, right next to the shore. A fruiting fig there was attracting many birds. Our first BLACK CATBIRDS of the day were accompanied by a single Gray Catbird. Eastern Kingbirds, Western Spindalis and Yucatan Vireo were all feeding here. We left that spot and headed for one farther south. Just as we reached the end of the road, a small flycatcher was working the bushes. We both knew immediately we had never seen it before. It was brown overall with pale brown wing bars. Very small with a bill that was dark above and orange below. It was a YELLOW-BELLIED ELAENIA! Not even on my list of hopefuls. As we walked up the road from there, I spotted a bird in a thicket. 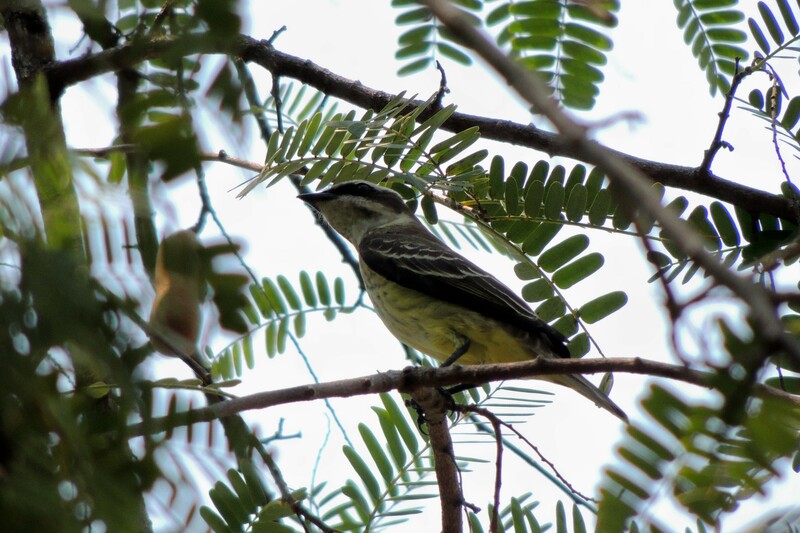 It turned out to be a COZUMEL VIREO!! Another lifer and endemic. We finally decided to call it a day. As we headed back north, a blackbird along the road flew up. Immediately, I saw it had an obvious pale yellow bill. Another lifer, YELLOW-BILLED CACIQUE ! It was after 3PM and we had to get gas and return the rental car. A storm brewing on the horizon hastened out trip. We got everything done and had a half an hour to spare, just before the rain hit. What a great day! Saturday 4/19 we spent the day at sea, heading north east toward Tampa, Florida. It was a beautiful day and we did lots of partying again! I concluded the trip with 105 species of birds. We had a final wild night of drinks, dinner and kareaoke with our new friends Josie and Colleen. We arrived in Tampa overnight and disembarked after a great final breakfast. Now for the long drive home. I want to thank Mark, Theresa and Kim for helping make this a great trip, we had a lot of fun! I would also like to thank Tommy Rogers for our time together, we made a great birding team and hopefully we will have more adventures in the future. 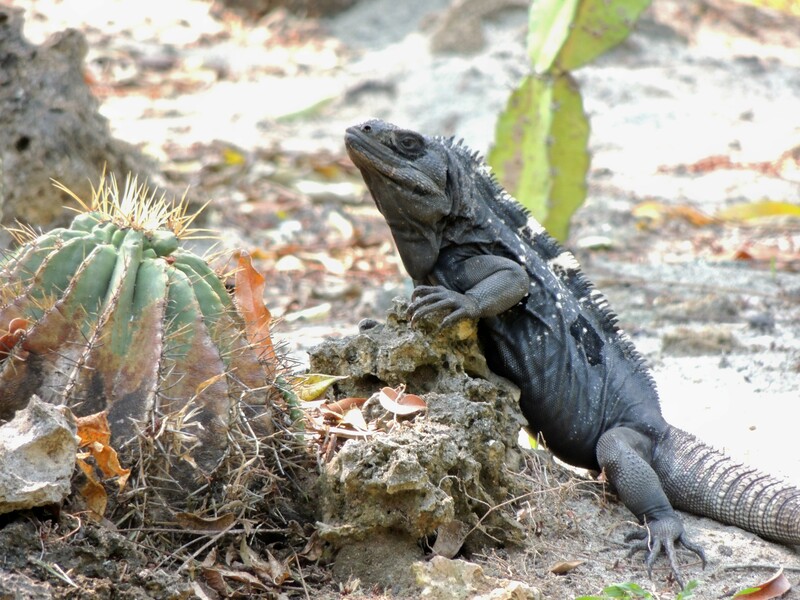 Scroll down for photos of Mammals, Birds, Reptiles, Mayan Ruins and more birds. Remember, just click on any photo to make it larger. Me in front of the second temple at Chocchoban. 8 Responses to Western Caribbean Cruise! The Mango and more !!! Great birds, especially the Black Catbird. Congrats on a great time. Talk soon. Thanks Bill, can you believe it, my two biggest nemesis birds in one trip Mangrove and Mango! Welcome home John. You got some great pictures and I’m glad you had a productive and fun trip. Looking forward to seeing you at the Bash. WOW, John what great shots you were able to get! I’m glad you had a good time and were so successful but nice to have your bird brains (LOL) back home for my numerous questions to be answered all the time!! Amazing. I am going on the Western Caribbean cruise in April and I plan to do some birding. I am glad I came across this post. Thank you. Thank you, I hope you have as good a cruise as we did! Let me know how you make out!